Home » Case Studies » Milwaukee Police Dept. 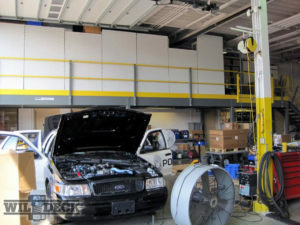 In the City of Milwaukee, the Police Department Radio Shop focuses completely on maintaining the central radio communication needs of the city’s response vehicles. The vehicles include all police, fire, rescue, water, and all department wide trucks and vehicles. The Police Department Radio Shop provides vital services – all behind the scenes. This ensures that the officers and emergency response teams on the street and at headquarters can communicate immediately, clearly, and with zero errors in their communication system. Maintaining the city’s fleet of 80 vehicles is a real commitment. The Radio Shop employs eleven full time and two part time staff members to keep the communication department functioning at its best at all times. David Go, the Electronic Technician Foreman, has been with the city for more than ten years, five of them as a foreman. 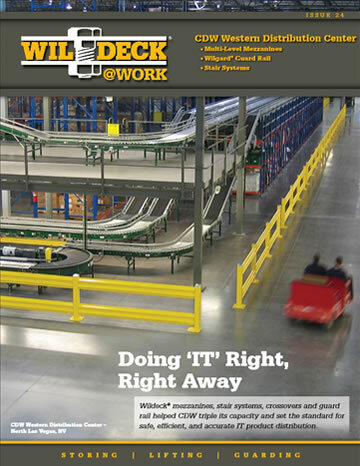 Before the addition of the Wildeck® mezzanine, space was at a premium and boxes of communication parts were stacked on pallets up to eight feet high. Now, as new radio parts are received, it is much easier to identify older material and rotate the inventory. The existing facility is not a spacious building, but the team at the Radio Shop worked to make it effective so they can quickly turn around the vehicles. A now-retired member of the team looked into several solutions, knowing that increasing the building size or relocating were not viable options. He determined that a mezzanine would be the best solution for the available space. 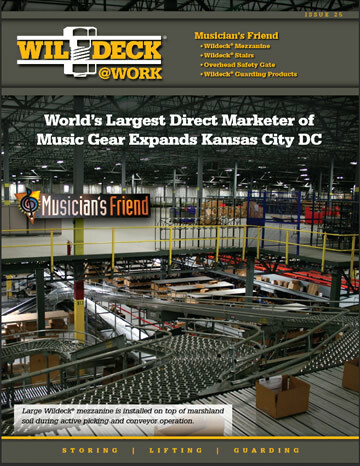 Stoffel Equipment and Wildeck were contacted to create plans to incorporate a Wildeck® Mezzanine at the Radio Shop. 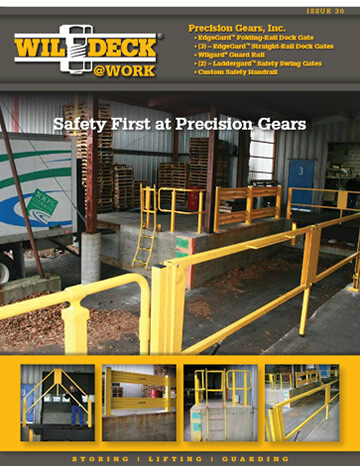 Stoffel Equipment is a trusted partner of Wildeck with the practical capabilities and know-how to utilize space in the most efficient manner possible. When it comes to continuous improvement, Stoffel works with their customers to understand that efficient materials handling is the key to the success of their operations. 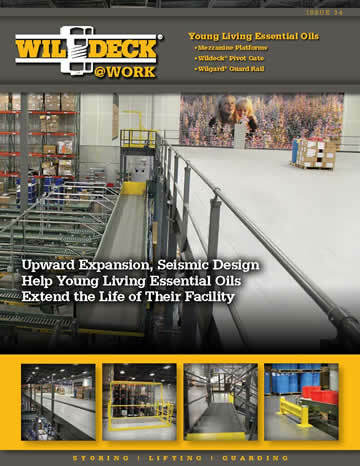 After careful design review, the Wildeck® Mezzanine specification was approved, released, and Stoffel was awarded the project. 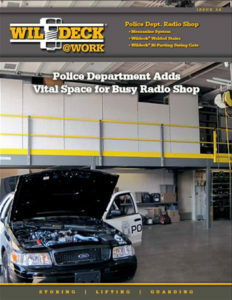 By adding a Wildeck® Mezzanine, the overhead space is now fully utilized and the Police Department Radio Shop has gained valuable working, storage and repair space at a much lower cost than new construction. To incorporate the mezzanine into the available space, Stoffel and Wildeck had to design and install the mezzanine around access doors to the office, a janitorial storage area, and waiting rooms; as well as lighting fixtures and electrical conduit. David and his team are utilizing the newly created space with no problems. It allows them to work faster, locate parts quickly, and reduce the interruption to their working floor area. As with any addition to a workshop, planned improvements must consider future needs. 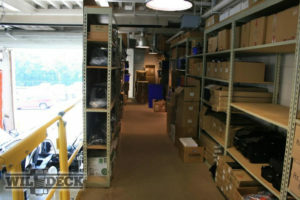 Currently, the team at the Radio Shop does not utilize a fork truck, but the mezzanine has been designed for it by including a Wildeck® Bi-Parting Swing Gate. This will allow the mezzanine space to stay current should the operation of the shop floor change. The mezzanine has helped improve workflow and productivity by providing Radio Shop employees with the room they need to efficiently perform their essential services.